This was the first project work that Willats made that focused on one building rather than an entire area or more than one area. Skeffington Court was an isolated tower block, surrounded by houses and lower rise housing blocks in suburban West London. 1. 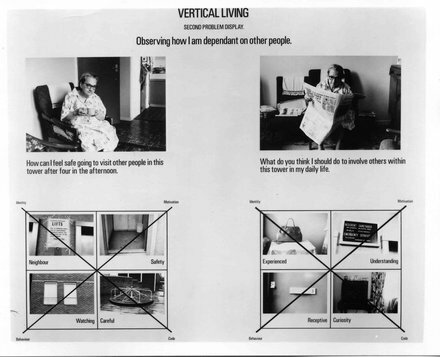 Residents of the tower were directly invited to participate in a process of encoding themselves into the work’s fabric. Once the Problem Displays were completed, one of the group of Project Operators visited all the residents of the tower block and asked if they would like to participate in the interactive project. Participants received a Project File and every two days one of the Problem Displays was set up by the lift on one of the floors of the block, gradually reaching the thirteenth floor. The participants then recorded their own response to the problem situation defined by the Display Board and all the varying responses were shown together on the Register Boards by the lifts. Thus people could compare their responses to other people’s. 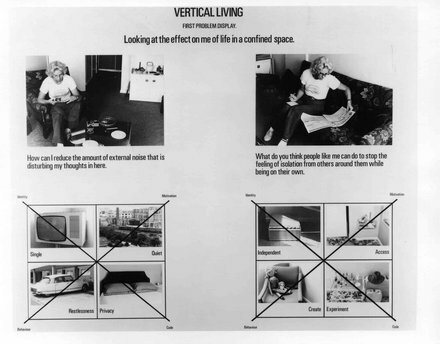 The Displays evolved from problems around the isolation of individuals in the tower to more conceptual issues such as how they might establish their own organization to overcome the problems of life in the tower. This sequencing led participants from a descriptive analysis of their situation, to the transformative notion that they could re-order their lives as a community. All the Display Boards were in place after 14 days, and remained there for a further week. At the end of the project a meeting was held with all the participants, project operators and the artist to discuss the project together.